On this date 80 years ago, Hoover Dam, one of the great engineering feats of the twentieth century, was formally dedicated during a ceremony attended by President Franklin D. Roosevelt. Of all the sights at the dam, most visitors find the artwork most striking, especially the two Winged Figures of the Republic statues on the Nevada side. These seated figures by Oskar Hansen feature upwardly stretched wings and are 30 feet tall. Given that much of The Smith Center in general takes architectural cues from the massive public work just outside of Las Vegas on the Colorado River, it makes sense that we have our own version of the iconic work. Among the striking décor and structural magnificence of Reynolds Hall, one of the most noticeable pieces of art is the Genius in Flight statue by sculptor Benjamin Victor. 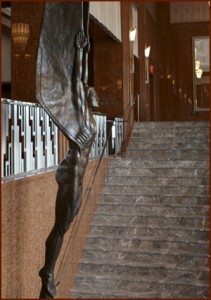 It’s nearly impossible to miss – the winged figure is centrally located in the Grand Lobby between the two graceful flights of steps that ascend to the mezzanine. Also, it’s 16 feet tall and made of bronze. Victor describes the process of how Genius in Flight came to fruition. Victor added, “I am very proud of Genius in Flight. He is monumental in scale and vitality. It is gratifying to know that generations of people from all over the world will come to The Smith Center to enjoy this work of art. I am pleased to have been a part of such a great undertaking, for the state of Nevada, and the city of Las Vegas,” said the sculptor.